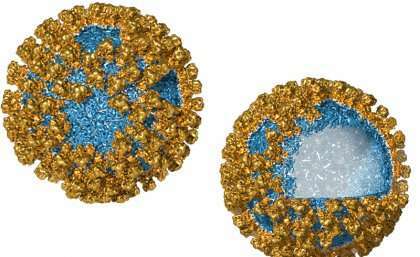 Researchers at The University of Queensland's Australian Institute for Bioengineering and Nanotechnology (AIBN) have designed a virus-like nanoparticle (VNP) that delivers drugs directly to the cells where they are needed. The lead author of a paper on the topic, Dr Frank Sainsbury, said the VNP was made from the structural proteins that formed the virus's protective shell. "Viruses have evolved to contain and protect bioactive molecules," Dr Sainsbury said. "They've also evolved smart ways to get into cells and deliver these bioactive molecules. "The VNP is an empty shell. It looks like a virus but it's not infectious. This makes it safe to use as a targeted drug delivery system." Dr Sainsbury teamed up with Dr Michael Landsberg at UQ's School of Chemistry and Molecular Biosciences and researchers at the Institute for Molecular Bioscience and the UK's John Innes Centre. By providing plant cells with genetic instructions for making VNPs, the plant was able to assemble virus protein shells without any permanent change to the plant's own genetic code. "This research unlocks a myriad of potential applications in therapeutic delivery," Dr Sainsbury said.